Chia seeds are one of those strange ingredients that you’re unsure of at first, but then you realize that they’re incredibly delicious and you wonder why you haven’t been eating them your entire life. 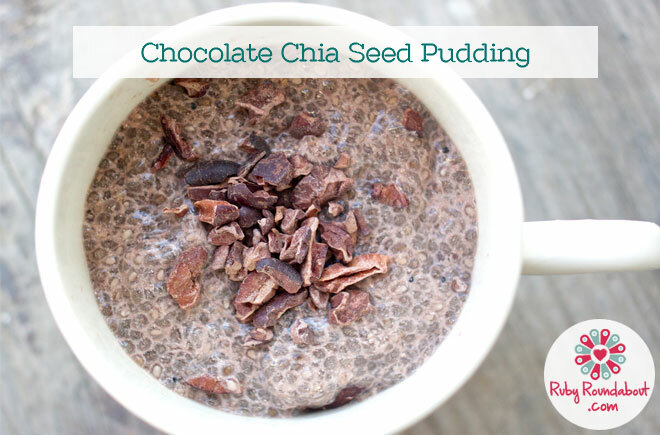 If you’re just introducing yourself to chia seeds, this recipe is sure to get you hooked. Who doesn’t love a nice, chocolate snack? The trick to making this dessert guilt free is using cacao powder (and topping the pudding with cacao nibs). What is cacao, you ask? It’s what chocolate is made from – without all of the extra ingredients and sweetener. This means you’re getting all of the nice, rich chocolatey flavor, with none of the guilt. If you find that the pudding isn’t sweet enough for you – it can be difficult to switch to cacao if you’re used to sugary milk chocolate – then feel free to add a small amount of agave nectar or your favorite raw honey to sweeten it up a bit. Cacao powder and cacao nibs are full of antioxidants, have anti-inflammatory properties, reduce your risk for certain types of cancer and help promote a healthy cardiovascular system. Once you discover cacao, you’ll never go back. As for the chia seeds, they offer tons of omega 3 fatty acids, calcium, protein and antioxidants. Two super foods in one dessert? Yep, you’ve hit the jackpot. Mix together the almond milk, cacao powder chia seeds and sweetener (if using) in an 8oz mason jar. Close the jar and shake well. Place in refrigerator for 4 hours – although overnight is better. When you return, you’ll see that the chia seeds have soaked up the liquid, becoming gelatinous and turning your dessert into a wonderful pudding consistency. 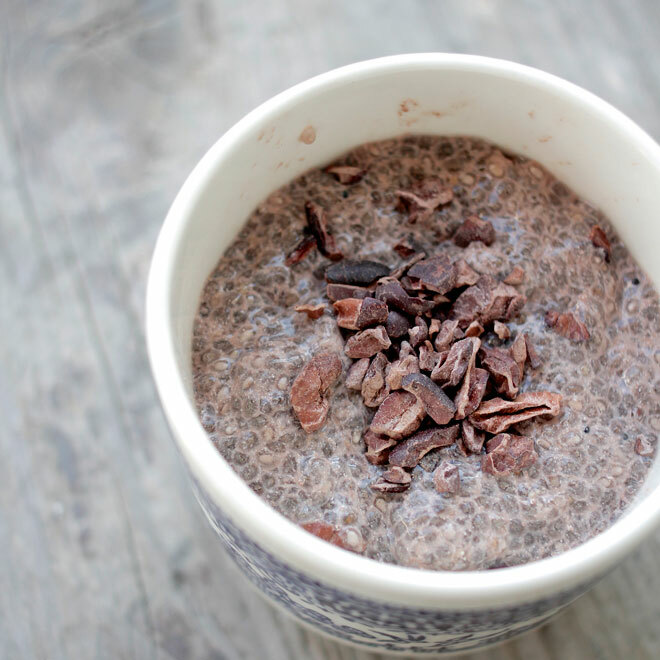 Top with cacao nibs and serve!